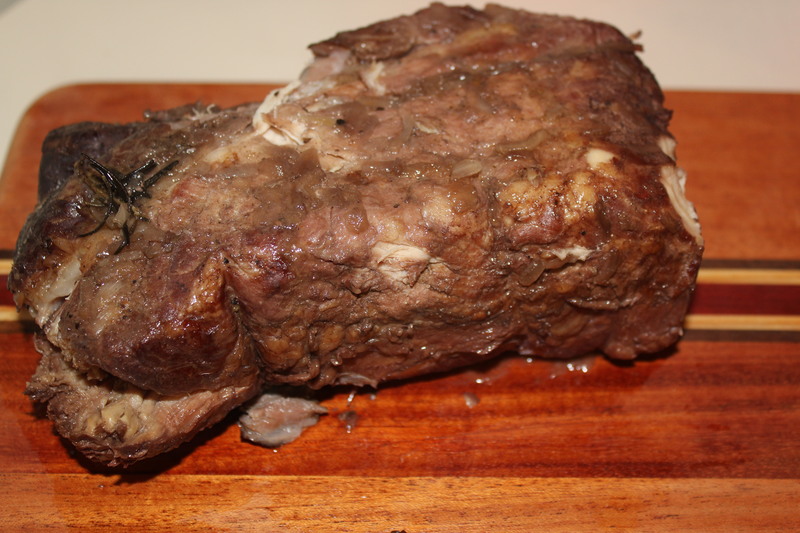 Sirloin pork roasts were on sale the other day, so I picked one up to fix in my slow cooker. This recipe is big, big, big in flavor and so easy to prepare with just a handful of ingredients – throw everything in the crockpot and let it do the work for you! Use the leftovers for yummy sandwiches. Turn crockpot to its “high” setting. Rub the pork roast with the garlic, salt and pepper to taste. Cover the roast with garlic cloves, bay leaves and rosemary. Place each onion quarter around the roast. 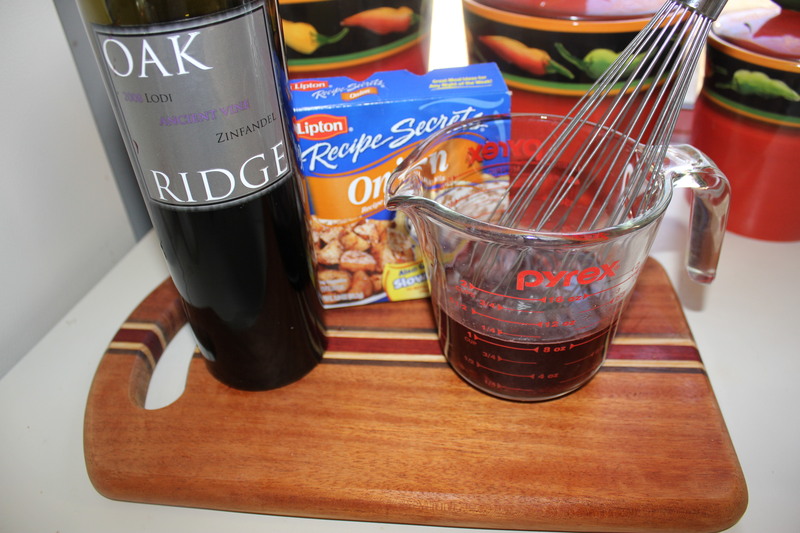 Whisk the dry soup mix with the wine, and pour over the roast. Slow cook on high for 4-5 hours, depending on your crockpot. Pork should reach an internal temperature of 145 degrees. I spoon the soup/wine mixture over the roast several times while it’s cooking. Serve with garlic mashed potatoes and some of the “gravy” from the crockpot and green peas or other veggie of your choice. Applesauce makes a great side as well. 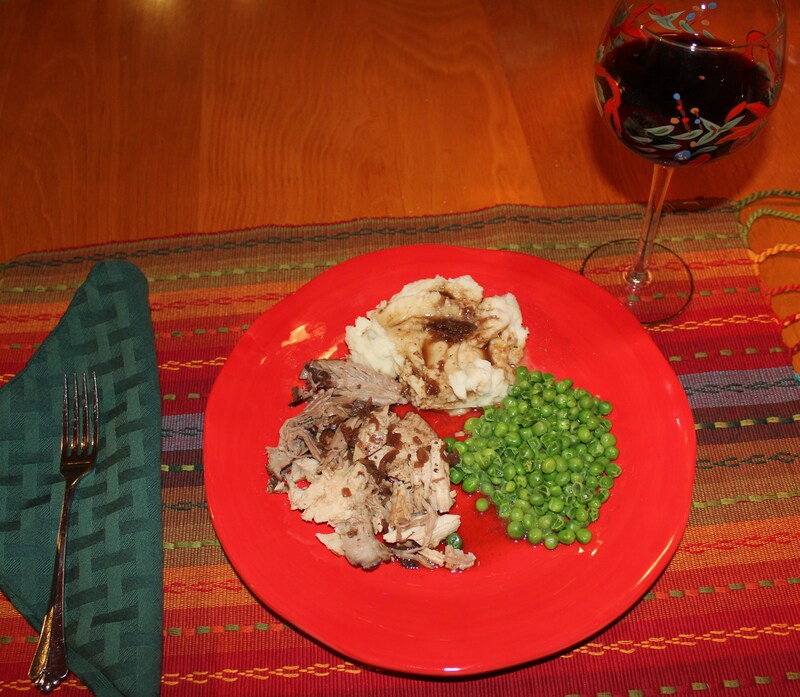 This entry was posted in Meat and Poultry, Recipes, Slow Cooker and tagged boneless sirloin pork roast, crockpot pork roast, eat drink and be merry, kel's cafe of all things food, Kelley Chisholm blog, pork roast recipes, pork roast red wine onion soup, pork sirloin roast, slow cooker pork roast. Bookmark the permalink. Thanks – it is so good and so easy to make! 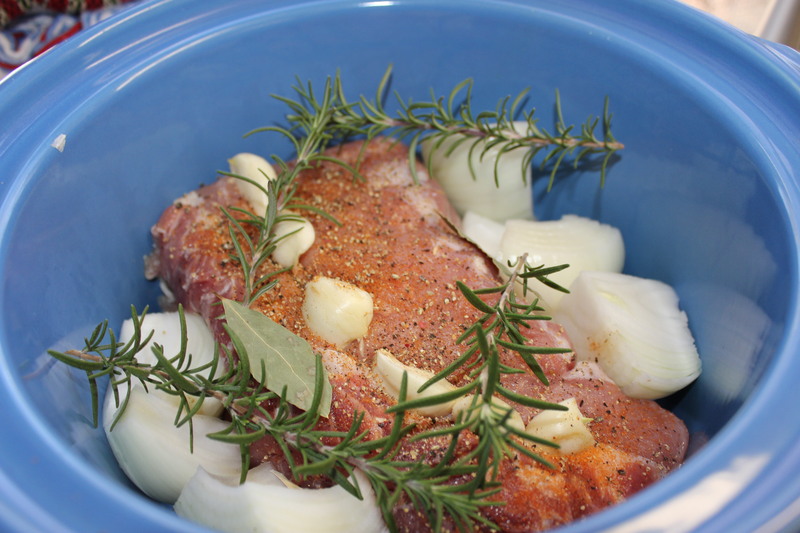 Good luck, but you really won’t need it – the slow cooker will do the work for you. I hope you enjoy! If you don’t want to use the wine, you could subtitute it with water or a cup of beef broth. I am making this for the fourth time today. I love it. I have substituted apple juice for the wine the last two times and I will be today. Ooooh – apple juice instead of the wine – great idea! Apples and pork go well together. I’m glad you like the recipe and appreciate your feedback! I only have beefy onion packets. Will that work? Absolutely, Nilda. I may try that myself next time I make it. Can I cook on the low setting? For how long?? It depends on your slow cooker, but I would say between 7 and 8 hours. You just want to make sure that the pork reaches an internal temperature of 145 degrees F.
I made it for my husbands family and they all liked it, thanks for making me look good! I’m so glad they liked it! Thanks for trying this recipe, and especially for the nice feedback! This recipe took me to the top baby!! Yummy. Thanks! It’s one of my favorites, and so easy to make! I’m glad you like it! It is so easy and tastes wonderful! Can you start with a frozen pork roast? Or does it need to be thawed? I always thaw my meat first, because of safety reasons. Since you’re cooking this in the slow cooker, the meat won’t get up to the needed temperature fast enough and bacteria could start forming. You could defrost your roast in the microwave first, I suppose, but I’m not sure what that would do to the overall texture. Good question! Thanks for letting me know – I was just going by what was on the label of the meat, from a store that I trust (or used to). I’m going to be making this today (about to go set up the crockpot now). I’ll come back and let you know how it fairs. I certainly have high hopes as it sounds delicious. Because of my dietary restrictions though, I’m using dried minced onions instead of the onion soup (contains sugar and other stuff I can’t eat). Please let me know how you like this, Rebecca. It really is so easy to make and so good to eat! Oh my goodness this is DELICIOUS!! The pork just falls apart with just a slight touch of my spatula. It’s juicy and flavorful and … I’ve got to go get some more! It is so good and so easy! Glad you enjoyed it! Can you also add veggies ? Absolutely. You may want to add some extra liquid depending on how many veggies you add. I think potatoes, carrots and celery would go great with this. 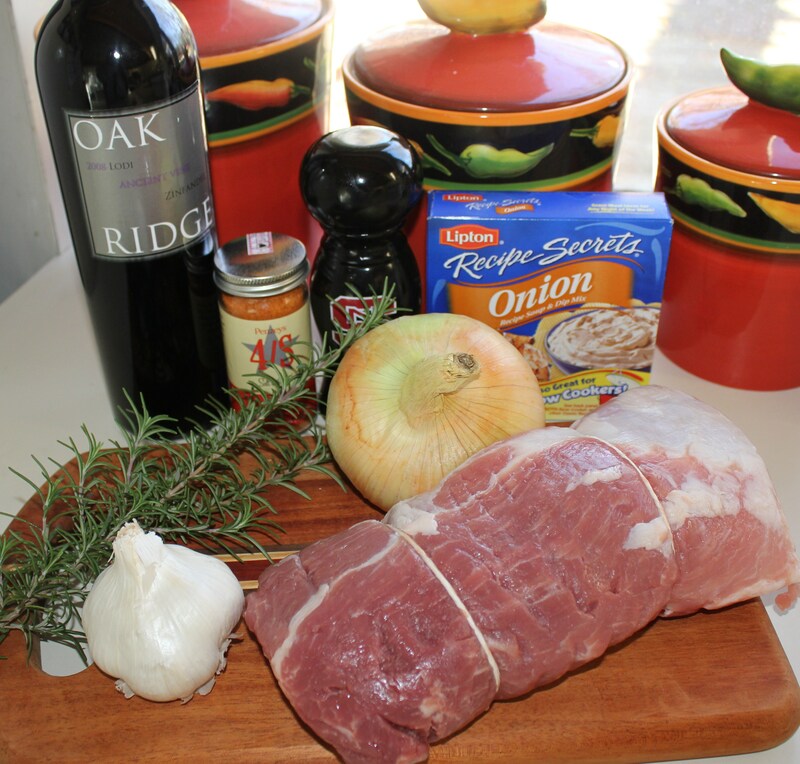 okay…..trying this today…..I saw the coment about the type of meat you were using….my label says Pork Sirloin Mini Roast (does anyone know what that is? )…..the cut doesn’t look like the tenderloin cuts I get which have a cylinder type shape.. The plan is the low setting for a longer period of time; I generally cook my tenderloins to 140 so I’ll be doing that here as well. Replacing rosemary with marjoram just because I have it…..will report after eating (and drinking). Looking forward to hearing how this turned out. Thanks for using one of my recipes! Made this today, and it was delicious. Used beefy onion soup mix with one cup of water and substituted Lawry’s salt for the Penzey’s salt. Will be making this again! Thanks for the recipe! Thanks for your feedback, Diana. I am so glad you enjoyed it! 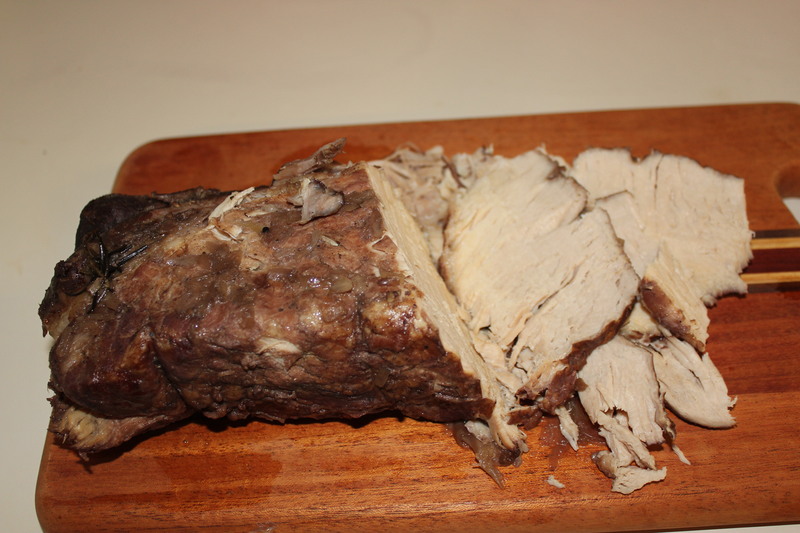 I have a large pork siroloin roast (8 -9 pounds) Can this be slow roasted in the oven at 300 degrees for 8 – 9 hours to replicate a slow cooker? Covered pan? Will the meat be sliceable or just fall apart? Either way is ok.
Hi Mary, I’ve never prepared a pork roast this way, so I’m a bit hesitant to answer because I don’t want to steer you in the wrong direction. I did find this recipe that you may want to try (it recommends 250 degrees for 4-8 hours) http://www.livestrong.com/article/439318-how-to-cook-pork-roast-uncovered-at-250-degrees/ I would be quite interested in your results – please share them with me and maybe I could do a guest post of your final recipe if you think it’s bloggable! Thank you so much for visiting Kel’s Cafe! this sounds delicious ! do you think I could substitute beef sirloin for the pork ? Marina, I think you could absolutely substitute the sirloin for the pork! 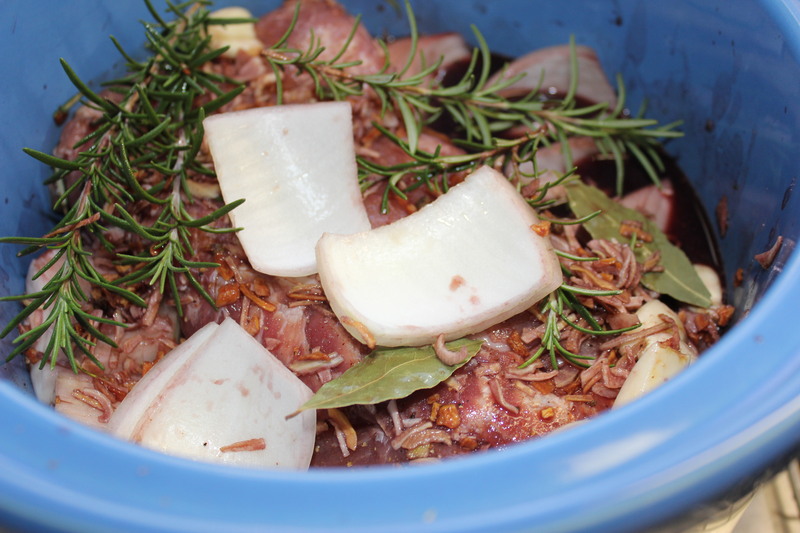 You may want to omit the rosemary and alter the cooking time, depending on how rare or well-done you like your beef. Please let me know how it turns out, and thanks for visiting Kel’s Café! Can you use frozen, or is it best to use it thawed? I don’t think that’s a good idea. The temp of the meat stays at a dangerous level for too long, allowing for bacteria growth. I would definitely thaw it first, just to be safe! Thanks for your question.